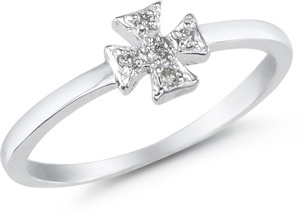 Maltese Cross Diamond Ring Set in 14K White Gold. Diamond Cross measures 1/4" in size. Band measures approx. 1.7mm wide. We guarantee our Maltese Cross Diamond Ring to be high quality, authentic jewelry, as described above.